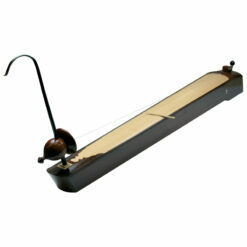 DAN BAU (BAU MONOCHORD) is also called DAN DOC HUYEN or DOC HUYEN CAM. DAN BAU is thought to have originated from the rural areas in the northern Vietnam. 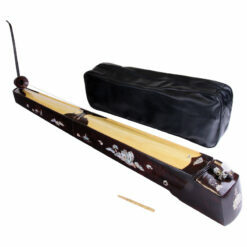 Although the instrument has only one string, it can be used to perform numerous melodies with ornamental techniques which is soft, expressive and sweet, close to human voice. The specific feature of the DAN BAU is the use of overtone technique in combination with the vibrato technique of the instrument’s spout to create soft and expressive ornamental notes. 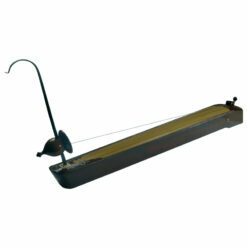 Moreover, the DAN BAU can be used to perform different scales and modes in a flexible way. The ambitious of the DAN BAU is around three octaves. The DAN BAU is performed as solo, ensemble and accompaniment for singing. In performance, the left hand of the performer holds the spout to push or pull out in the vertical direction of the instrument’s body, making the string loose or more stretching to create different pitches or technique of press or trill. Meanwhile, the right hand is used to hold a small pluck stick, plucking and slightly touching at the same time on points 1/2, 1/3, 1/4, 1/5 … to create overtone on the string.